CAN (Controller Area Network) is a serial bus control protocol especially suited to structure intelligent industry devices networks and build smart automatic control systems. 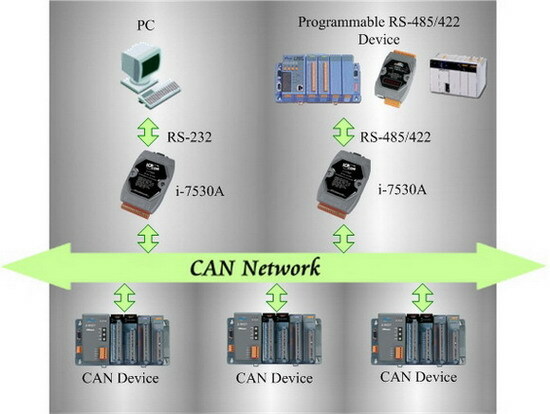 By using I-7530, some programmable RS-232 devices such as PC, I-8411/I-8431/I-8811/I-8831 embedded controllers, can be the master of a CAN network. Therefore, they can control or monitor the CAN devices via the I-7530 module. 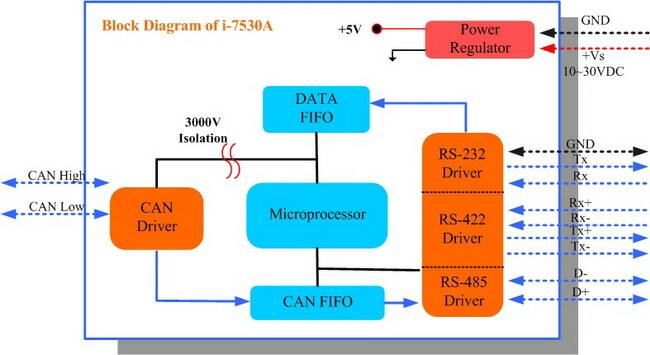 The I-7530A is designed to unleash the power of CAN bus via RS-232/485/422 communication method. It accurately converts messages between CAN and RS-232/485/422 networks. This module let you to communicate with CAN devices easily from any PC or devices with RS-232/485/422 interface. Moreover, we expand the functionalities of I-7530A for some special application. 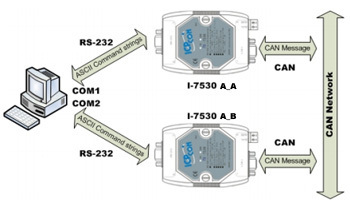 In pair connection mode, I-7530A can be used to connect PC with other RS-232/485/422 devices at the same time. The application architecture may be as follows. 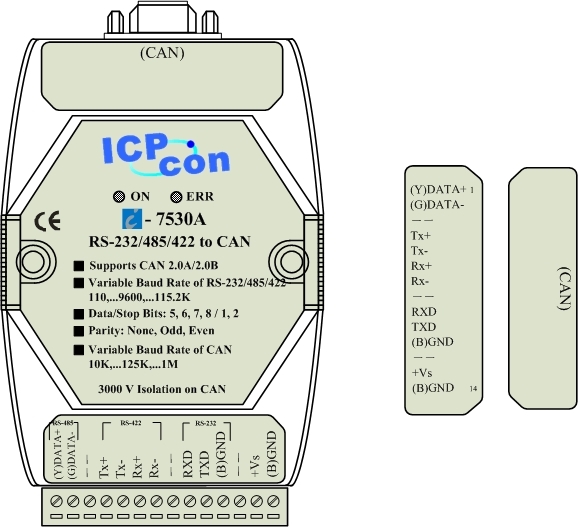 The CAN port of I-7530A is an isolated with 3000V isolation. 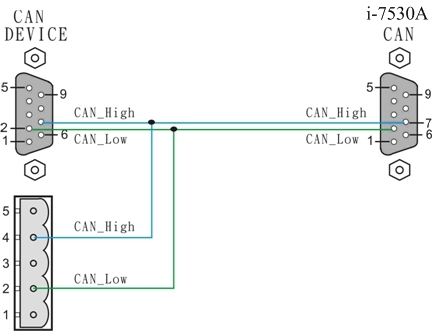 This isolation can protect the local RS-232/485/422 devices from the damage signal coming from CAN network. The I-7530A Watchdog is a hardware reset circuit to monitor the I-7530A’s operation status. When working in harsh or noisy environment, the I-7530A may be down by the external signal. The circuit may let the I-7530A to work continuously and never halt. There are two indicators on the I-7530A.The power indicator can help user to check whether the I-7530A is standby or transmitting/receiving messages. The Error indicator will be turned on when some errors occur on the I-7530A. 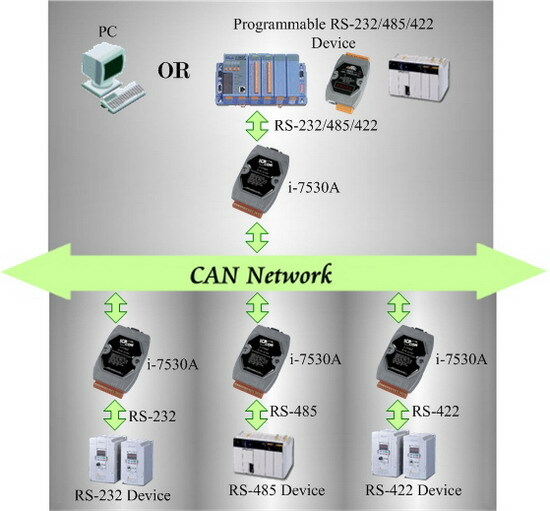 Provide the transparent communication between the RS-232/485/422 devices via CAN bus. Enable different RS-232/485/422 devices into an individual group in CAN bus network. It has a CAN message field which can display the receiving CAN messages in Decimal or HEX mode. Can display the timestamp of each received CAN message. Users can change the display mode, up-down, down-up or stop. It can count the number of received CAN messages. Data Log : It can save the CAN message as “ txt ” file. Has CAN ID filter function. 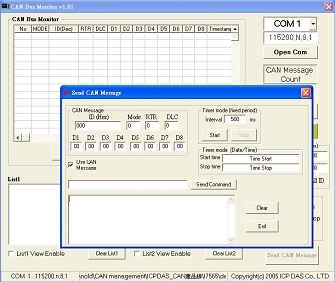 Can send CAN message to CAN BUS according the defined interval time. Performance Test: Transfer 8 bytes data frame from RS232 to CAN.